Apple In-Ear Headphones Review – Best in-ear headphones for music? Today we are going to do the Apple In-Ear Headphones review. Is it one of the best in-ear headphones for music? I really like the basic Apple headphones but there are times when I want to listen to music and not hear the background noise of the people around me. So I bought an in-ear type of headphone as a replacement to my old basic headphones. I have been using the Apple In-Ear Headphones for more than a year now. The package comes with the Apple In-Ear Headphones (with remote and mic), carrying case (which I rarely use), three sets of silicone ear tips, and two replacement mesh caps. Now let’s go to the detailed review. What I really like about this headphone so much is that when I am using it, I can’t hear the background noise of the people talking around me. It helps a lot when I am trying to do something and I need everything to be quiet except for the music that I am listening to. It gives me a lot of peace of mind so that I can think clearly when I am concentrating on something. It will be useful to you as well if you are in a very noisy place and you just want to listen to good music. It comes with three sets of silicone ear tips with small, medium, and large sizes. I normally use the medium size because it fits perfectly in my ear. If you don’t want it to get in your ear so much because it might get uncomfortable for longer periods, you can just simply switch to the large ear tips. The large ear tips will normally only be at the base of your ear because it is a bit huge to fit in. So you can wear this type of ear tip without having too much pressure pressing in your ear. 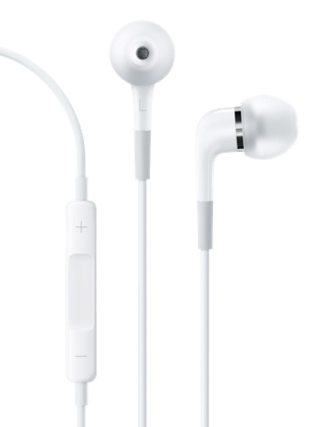 The Apple In-Ear headphone’s price is $79 at the Apple Store. It is a bit pricey, but if you really need the in-ear type, I think it is worth the price. This is because other in-ear types can go as high as $200 and still offer the same sound quality. You can just check other online retail stores which might offer a lower price than the official Apple store website. For example, you can get it in Amazon for as low as $63. That’s a $16 savings. I got mine for only $69. Another cool feature of this headphone is that it comes with stainless steel mesh caps for protection. 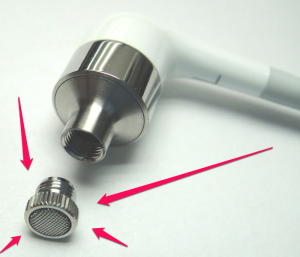 These mesh caps are located at the tip of the headphones and are covered by the silicone ear tips. What it basically does is it filters all the dirt and dust that may get inside the earphones. You can remove these mesh caps and clean it with a brush. In case you accidentally drop it and it got lost because it is too small, you can still use any of the extra two replacement mesh caps that comes with the package. The Apple In-Ear headphone is definitely an awesome product. If I were to compare it with the sound of the basic Apple Earpods, the basic Apple Earpods has deeper and richer bass tones. But any in-ear types of headphones normally are not on top with this feature because they are normally smaller in size. Don’t get the idea that the bass tones of the in-ear are inferior. Its bass tone quality is still a lot better than the other in-ear headphones like Philips and those that are within the same price range that I have used in the past. The sound quality for me of the Apple In-Ear headphone is still awesome. 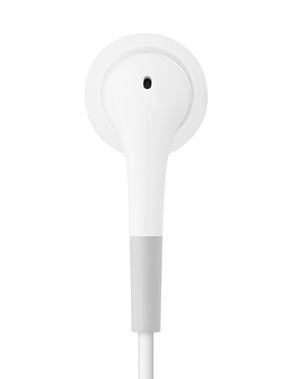 The basic Earpods is perfect to use if you are in a quiet environment or if you want to be aware of your surroundings while listening to music or calling someone. If you feel like you frequently need to be completely isolated with the noise from your environment because it helps with your thinking and concentration on what you are doing or if you want peace while in a noisy place, the in-ear type is perfect and you will definitely get your money’s worth. What I also like about this headphone is that you can take control of your iPhone or iPod using it. It has awesome remote button controls that will allow you to conveniently adjust volumes, switch music or video tracks, or accept and reject calls. In addition to the above remote button shortcuts, the mic near the remote buttons also allows you to record voice memos. The iOS version is a factor for it to work. I experienced using it with an iPhone 4s with an older iOS version and the remote buttons did not work. So you must ensure that you have upgraded your device to one of the latest iOS versions for the remote buttons to surely work. The Apple In-Ear Headphones also allows you to listen to the audio of video and music tracks in your laptop or any other portable device with 3.5 mm jack. It has a low impedance of only 23 ohms, so it will also work with devices with weak amplification like portable music players. When it comes to the cable length and weight, you will find it not too long, not too short, and very light. The length allows you to put your device in your jeans’ pocket while using the headphones. It is 42 in./106 cm long, 13 in./330 mm to earpiece. My Apple In-Ear Headphones is still working even after a year now, but the actual wear and tear will still depend on how you take care of it. It is not sweat and water resistant so it may not be perfect if you are working out and sweating too much. Aside from the normal ways of taking care of earphones like not getting it wet or not stepping on it, there are specific things you will need to consider. Based on my experience, whether basic or in-ear type, you should avoid keeping your headphones in your jean’s pocket when not in use. The wire near the jack is more exposed to getting bent this way. Even if the rubber base protection near the jack does not get broken while in your pocket, the wires inside may still get disconnected. For the Apple in-ear type, the part which normally gets broken first is the rubber base covering the wire near the ear tip. After more than a year, mine starts to get loose. Surprisingly, the wire inside that is being protected by the rubber is still in perfect shape. But the rubber protection must be fixed right away so that it keeps on protecting the cable. If your Apple In-Ear headphone is still under the warranty period, you can just easily go to the nearest Apple Store or Authorized Service Provider with your receipt for warranty verification. I have seen discussion boards on the Apple website about warranty replacements. One customer’s 6-month old Apple In-Ear headphone stops working because it got wet from sweat during her work out, but it was replaced by Apple. Other users in the discussion board claim that Apple only normally replaces if the failure with the in-ear headphones is not caused by external or user based circumstances. 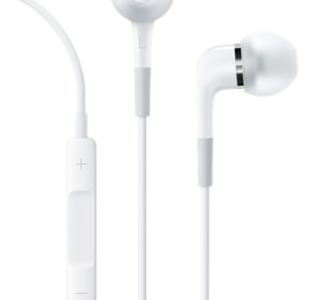 The in-ear headphone also comes with an elegant case that you can use to store your earphone when not in use. I rarely use this so my earphone gets exposed to dust and is a little less white than before. I normally put it in one of the pockets of my bag, but it still looks fine. I think it would have looked better even after a year if I have used the case. I will recommend the Apple In-Ear headphones to those who like to have total sound isolation while having good quality music. In my case, I cannot work with too much noise so the in-ear type really helps a lot. It is not as good as the basic Apple headphones when it comes to bass tones but its bass tones are still a lot better than any other in-ear headphone products out there.